Khandala is a hill station set at a height of 625m on the southern slopes of the Sahyadri mountain range in Maharashtra. 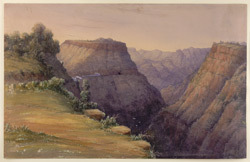 It has been a popular retreat for the wealthy inhabitants of Mumbai since the 1850s. The surrounding ghats are the main attraction of the region along with the Buddhist caves of Karla, Bhaja and Bedsa.